Our IndieGogo campaign is finished, and the order has been put in. Our laser cutter is on our way to us from China via cargo boat, and should arrive within the month! A huge thank you to everybody who donated, shared the campaign, or assisted in choosing the final laser. Once the laser arrives, we will begin creating and distributing donor rewards. We introduced our new logo last month! You may have seen it around the shop, or in your emails. The new logo also comes with color and font guidelines, to ensure publications from the shop are consistent between members, and can be laser- (or vinyl-) cut in one solid piece! Thanks to Tyler for all the hard work he put into designing it! There are now member storage spaces available upstairs in the loft! A huge thanks to Phil and Jake for building these new shelving units. Additionally, there are storage bins for use in member storage available for $10 each! The sewing room is complete at long last! Jeff, Michele, Travis, Phil, and many other were hard at work for months constructing walls, installing wiring, and moving in sewing supplies. This new climate-controlled space will be a huge boon as the weather starts to turn cold. Way to go!! Dmitriy and three of his friends created a Arduino-based rocket launcher and app for the Intel Hackathon, which was submitted in July! The app allows you to launch a rocket from a safe distance using your cellphone as a control device for the Arduino launcher. If you’re interested in building your own, or want to learn more about this super-cool project, check out their website! Here’s a recent project of mine. 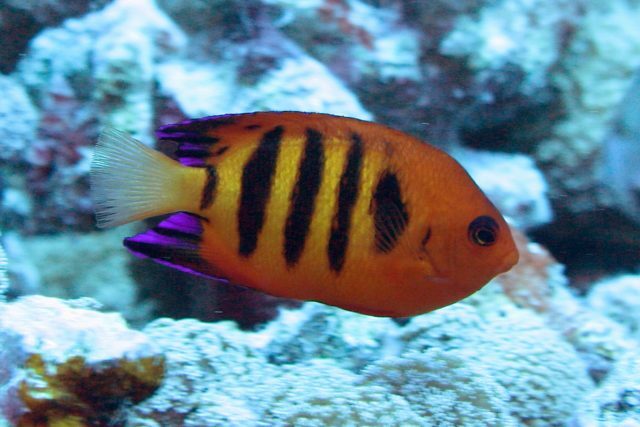 I started with the photograph of a flame angelfish. I created an embroidery pattern from the photograph. All of the purple, black, and yellow on the fish are embroidered on bright orange fleece. 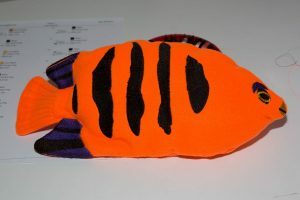 I made two copies of the fish, mirror reverses of each other, then sewed them together and stuffed it to make the fish. It’s intended as a baby toy, so having nothing that can fall off or get chewed off makes it a safe toy. Also, it’s completely washable, in the regular laundry cycle. Next Post: New ML256 Logo and Branding!